This is one of my catch up cards. It actually was part of the cause of my “bottleneck” along with my schedule. First I hate trying to describe myself. I really don’t see me as anything in particular and I don’t identify myself with any role that I play. It was Carol who hit on the idea of ying and yang as we were discussing the challenge of showing off my geek side and my traditional feminine side. So after much thought, I decided to take a photo of myself and put it into the ying/yang symbol. Then to add to the challenge, it decided to make the one side reflect the idea of a computer motherboard with the colours and the individual stitches down in needlepoint only to keep it angled like a pixel. The other side was done in surface stitches — maybe a bit more modern than the traditional “pillowcase” embroidery but definitely more free form. 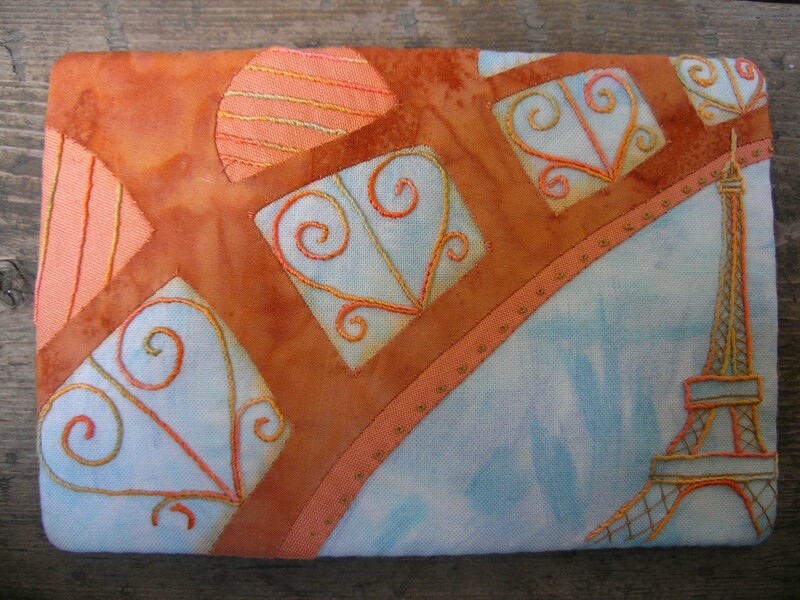 I then fused them onto a background of fabric and ribbon set up to look like a chocolate bar. The finishing touch was a saying my mom had, “Women think with both sides of the brain.” I thought this was going to be easy but without a grid, the cross-stitch alphabet looked weird. I then tried to draw on it with pigma pens but nothing showed up. So I laid down lines of thread and free-handed the words in back stitch. It’s a bit funky but mainly readable. And of course, there is always a mistake because I’d hate to be perfect. See if you can spot it? Unfortunately, the lighting for the photo was not consistent, hence the yellowish tone in the upper left of the photo. As we have heard from others, this final postcard resembles nothing of the original idea I had. In some ways that’s good, as I’ll be able to use that technique for another card. 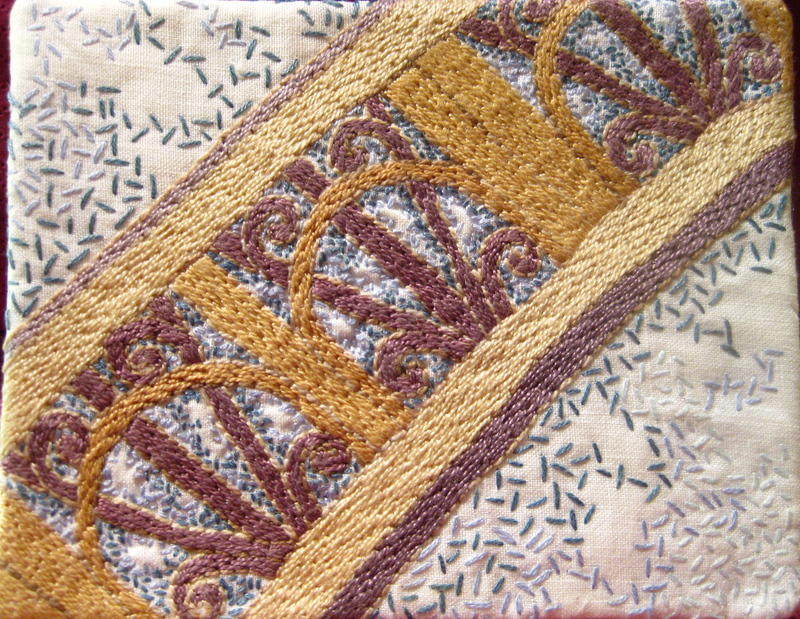 For lack of a better description, it is basically just a one-stitch technique – straight stitches. I simplified the pattern, but stuck with a limited palette as in the image. I’m finding it hard to believe that this is the last postcard I’ll be sending to some of you. It’s been a great two years. Thank you very much for all the kind words and encouragement you have lavished on me over the years. I have loved the challenge of the work. I particularly liked the inspiration for this card even though I used the strong girders in a girlish way. I could only think of fashion and some of the other things that Paris has to offer such as exquisite lingerie. I started with pink satin and ended with black net and some pearlized stars. For the girders, I used two different colours of floss, one being the brown colour that they really are and the other being black so that the design would show up more clearly. The frilly edging is just there to add intrigue and to lend itself to the lingerie look. Thanks for having me as part of the group. Some cards definitely were a challenge and very much a learning experience for me. Thank you to all who sent me very beautiful cards. This image is again based on the Sue Dove style, with a bit of artistic licence thrown in from me. Everything done in full strands of DMC on double needlepoint canvas. I do love that technique, can’t you tell! I enjoyed playing with the colours even though they are not quite the same as the actual Eiffel Tower. The blue and orange, being complementary colours keep each other singing. I liked the idea of bending the straight lines as well as playing with perspective. The card felt a bit empty in the one corner so I added a representation of the Tower. The stitching is done with an overdyed perle cotton from my stash. The fabric is all from my quilting stash. I’m sorry the orange ran a bit when I was washing out the blue pen. The girders in the mini tower are stitched with sewing thread. All in all I’m pleased with the overall effect. I’d like to thank one and all for your inspiration and your support. This past two years have been quite a journey. Good luck to those of you that are travelling on with the next exchange. I loved the architecture of this piece, but didn’t think I could pull it off in applique or surface stitchery, so had to go my reliable counted work. I used 18 count blue canvas. I would have preferred a lighter blue, but that wasn’t in my stash, so I guess we’ll pretend it was evening or nighttime. 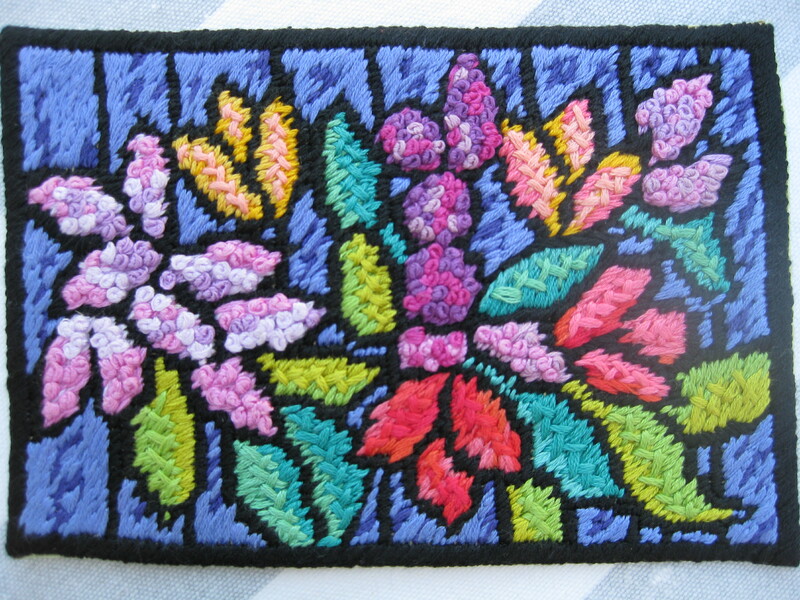 I used Caron’s Watercolours to do the needlepoint in the centre. 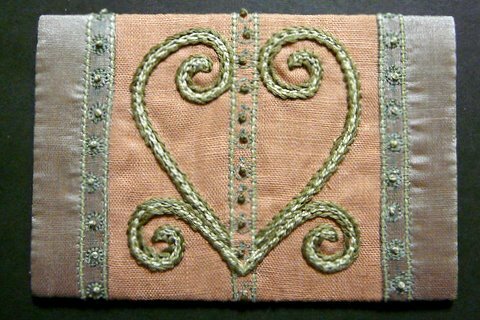 I used the continental stitch, but reversed them to do the left side of the scrolls. 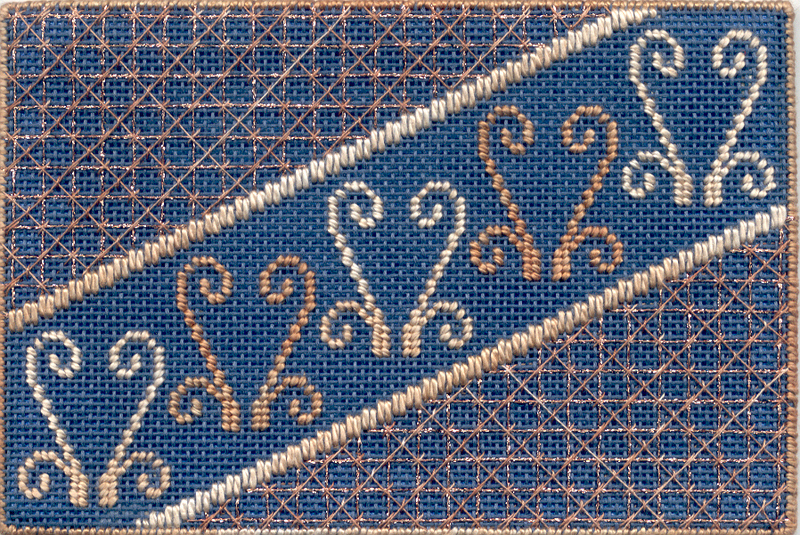 For the background top left and bottom right, I laid horizontal and vertical lines with a metallic #4 Braid from Kreinik. I couched it down at the intersections with a single strand of Gentle Arts thread. I used one strand of the same colour of Gentle Arts thread and laid down diagonal lines, couching it as I went. I have certainly enjoyed doing these postcards these past two years. I feel like we have formed a bonding and a connection with each other, and it was fun to stretch myself outside of my usual stitching techniques. I’m glad to see some of you have continued on to the next group with me too. 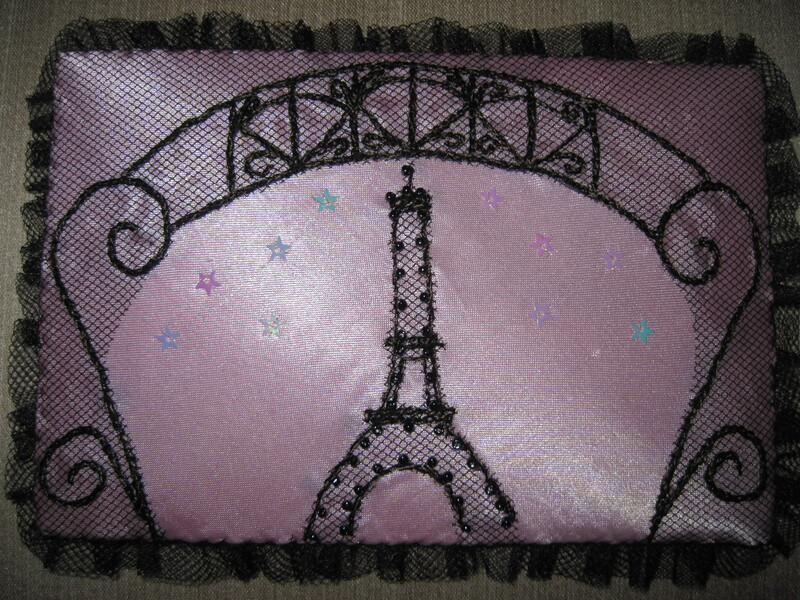 Some years ago I embellished a small purse with a pattern similar to the Eiffel Tower girders in the picture. I used rows of chain stitches to outline the pattern and I thought I would like to repeat that process. I drew a pattern from the picture using a portion of the girders. Then, because I liked the angle shot of the original picture, I tilted my drawing before copying it to the fabric background. The background is the wrong side of a blue antique satin fabric. It was shaded slightly using a pencil crayon and metallic gold paint was added. 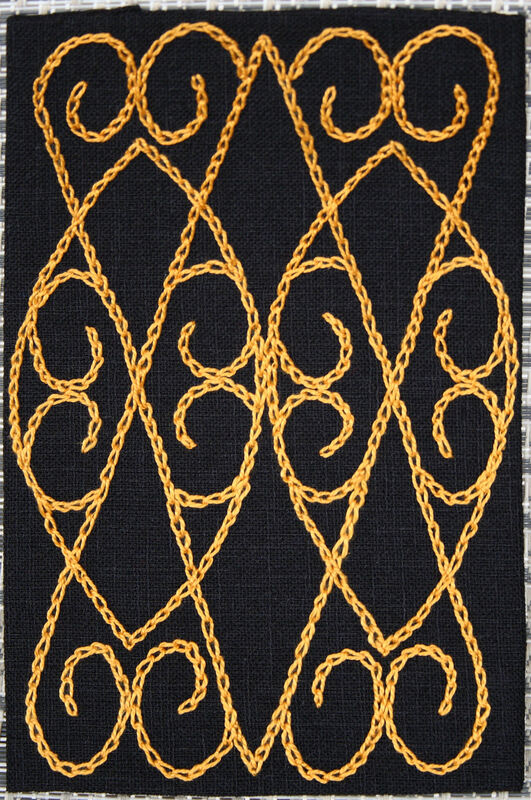 The chain stitches are done with #5 Perle cotton for the center row and the rows on either side of the center row. The outer edge chain stitch was done with #8 Perle cotton. Brown beads were added to the center chain stitches. 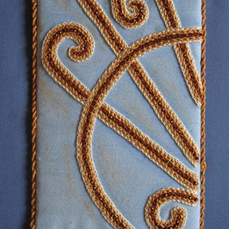 A cord was twisted, using the middle tone of brown Perle cotton, and attached to the edges. 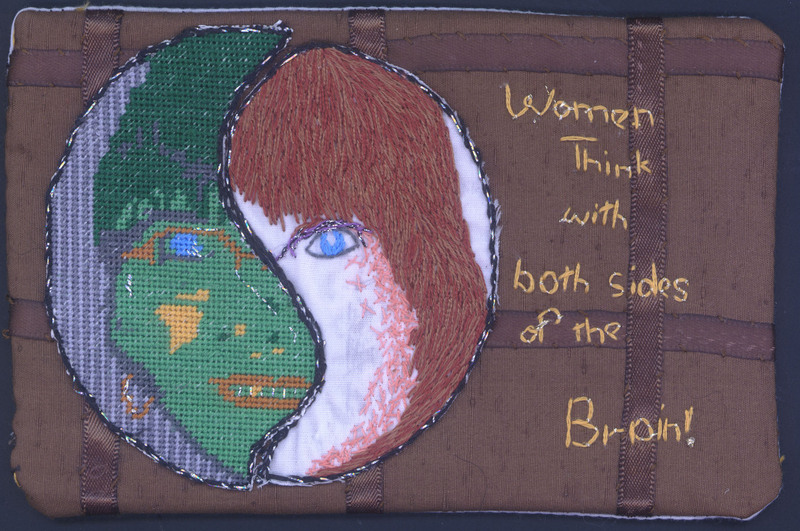 I don’t mind the interpretation that I did but I like the work that I did on the purse much better. Maybe that is telling me I shouldn’t try to repeat a pattern and stitching that I really like!! I loved the curls and swirls of the ironwork and was particularly drawn to the rivets on all that metalwork. So some metallic grey sheer fabric was applied to the sides of the centre curled ironwork and rows of raised “rivets” were applied down in columns. Chain stitch and French knots embellished some machine-made eyelets in a straight line to contrast with the curly bits in the centre. Linda has received my Eiffel Tower postcard. This one gave me lots to think about. I wanted to create something structural and stark but then I found the postcard material in my stash and I knew I had to use it! I then decided this should be a postcard as if from France. 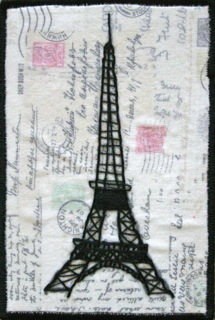 To make my card I took a piece of silk organza and laid it over an image of the Eiffel Tower and traced it . I then stretched it in a hoop and outline stitched the tower with silk thread . Different amount of strands for different thickness of girders. I fused the organza to the postcard fabric with fusing powder and then finished it off with a black border using a finishing technique from a Quilting Arts magazine. Quilting Arts is a wonderful resource to have. I’m usually not drawn to symmetry, but there was something about the iron-work swirls in this photo that drew me in. I took a small section and repeated and flipped and played with it until this design appeared. After that I decided to stay simple and just used gold floss to chain stitch the design on a black background. I think it’s simple but effective.